I might be a freak, but I actually don't look forward to the end of the school year. I enjoy coming to work everyday and teaching my students, hearing about something they did outside of school that was amazing and I genuinely get excited to start a new book or topic of study. So when I think about the end of the year, I get a little sad. I figure the only way to combat my sadness is to reflect on the school year with the students and take note of all the wonderful things that happened throughout the year and start to evaluate what will stay the same and what will change for next year. This is a cool idea I found off of Teacher Pay Teachers that ended up being a lot of fun and I have started to look forward to it when the last quarter hits each year. This activity is an opportunity for students to write YOU a report card! I think this is a great way for students to let you know what worked and what didn't work. You never know, you might learn something new about yourself and your teaching! I love this idea because it allows for students to use their creativity and writing skills! The teacher prints the template for the brochure (modified versions for Grades 1-6) and students reflect on their year. Each brochure asks students to think about their favorite book from the school year, their favorite writing activity, what they will miss the most from the grade they are in and what they look forward to for next year. This also comes with a writing activity where students organize a letter for upcoming students. There is a graphic organizer and letter writing paper for grades 1-3 and grades 3-6. 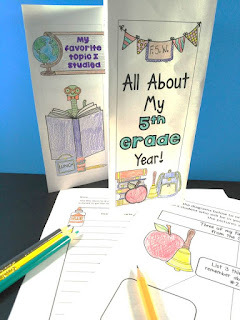 This activity is a lot of fun and has you partly prepared for the first day of school next year! When discussing student growth with a colleague, it was brought to my attention that it would be helpful to have students not only reflect on their academic growth, but their social growth as well. So, I created a graphic organizer that allows students to reflect on themselves as learners, as friends and who they are as a person. This graphic organizer asks students to identify 1-3 ways in which they grew academically and socially. There is a second page that helps students develop each idea and then ultimately write a letter to the teacher explaining how the grade they are in has impacted them. This makes for a really thoughtful and meaningful activity towards the end of the year. I hope that some of these ideas have helped you plan the last few weeks of the school year with your students. Leave a comment and tell me what has helped you make the most of your end of the school year!